Repair service including replacement glass panel and labor. Will fix a cracked or broken glass panel in a 13 inch Silver MacBook. 13 inch silver MacBook A1278 Glass Replacement. Will fix cracked silver MacBook screens by replacing the Glass panel. If the image on the screen is not distorted, but it looks like your silver MacBook has a cracked windshield, this is the repair for you. At EliteMacTechs, we specialize in mac screen replacement. 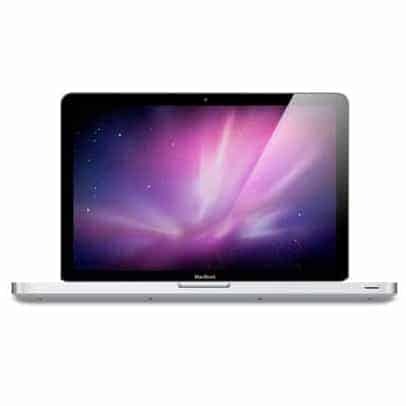 We have been repairing Unibody MacBook Pro’s since they first came out in 2006. We are able to disassemble the computer and offer component level screen repair. This means you save money and time by going through us instead of the Apple store! We only replace the component that is damaged, so if your glass is cracked but your LCD is not, replacing just the glass is all that is necessary. You can drop your computer by anytime during regular business hours and we will have it repaired within 24 hours, or you can ship your computer to us for repair and we will ship it back when complete. Please contact us with any questions.